October 31, 2016 By Elizabeth Lindemann 8 Comments / This post may contain affiliate links. I simply cannot remember a holiday meal without my late grandfather’s famous recipe for Twice Baked Potatoes. I can’t think of a better way to kick off #PotatoPalooza week than with the potato recipe that has the best memories for me, not the mention the MOST DELICIOUS taste ever! Thank you so much to the Idaho Potato Commission for sponsoring this post! As always, all opinions and endorsements are my own. Thanksgiving is just a few weeks away, folks (no pressure)! Christmas and Hanukkah are just a few weeks after that (again, no pressure). If there were ever a time to be thinking about potatoes, it’s now. Lisa at Panning The Globe shares delicious international recipes adapted for the home cook. Maggie at Omnivore’s Cookbook shares delicious Chinese and Asian recipes, geared to non-Chinese home cooks. 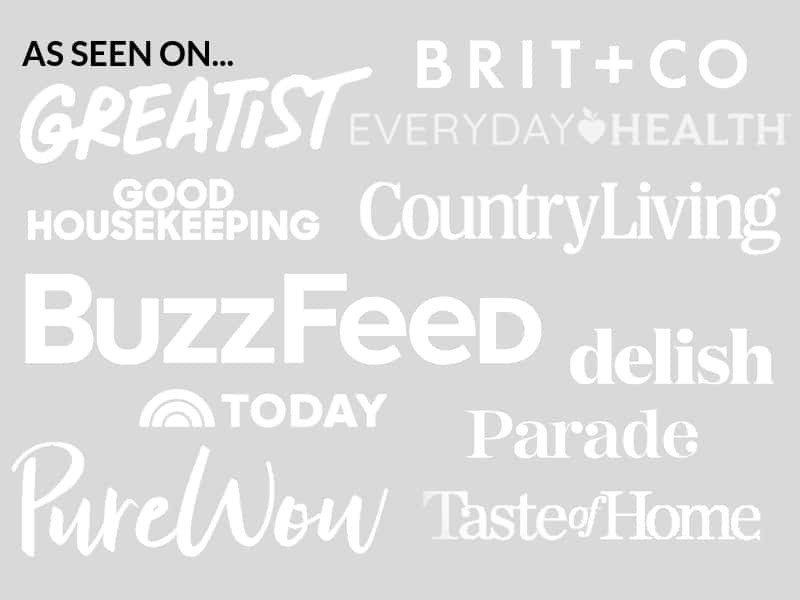 And I, as you know, write about real food for busy people- recipes made from wholesome ingredients that are freezable, make ahead, quick and easy, or made in the slow cooker. To me, the star of any Thanksgiving meal is the potatoes. Turkey’s great, and so are green beans… but the potatoes. Mmm, mmm. And I have to say that this potato promotion is happening at an extremely convenient time, since my #1 pregnancy craving has been potatoes. I’ve adapted these twice backed potatoes from my grandfather’s original recipe to be a bit creamier and healthier (well, healthier in that he used Crisco, and I used butter, which is at least a natural fat!). His story is very familiar to first generation Greek immigrants of his time: he co-owned a restaurant and made delicious, delicious food. The locals of Manchester, NH (where Roy’s Restaurant was located) can still recall the items on the menu and dining there regularly. You can make them ahead of time. Just assemble them and keep in the refrigerator or freezer until you are ready to do the second round of baking. This means you could literally make them TODAY and have one dish prepared for your Thanksgiving meal. Make sure to defrost them/bring them to room temperature before putting them in the oven! They freeze well. 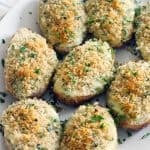 Unlike other twice baked potatoes, which can sometimes turn a funny texture in the freezer, these hold up beautifully. Why? All of the fat. I certainly didn’t skimp on the fat here- and in my opinion, you shouldn’t even give it a second thought when it comes to Thanksgiving. The fact that every starchy morsel of these potatoes is wrapped in cream and butter protects the texture from going haywire in your freezer. In addition to making them ahead of time and freezing, you can also freeze any leftovers you have (in the unlikely event that are any, of course!). This recipe serves 8 people and uses 4 potatoes. If you’re expecting more company for the holidays, you can very easily double it, or just add a few more potatoes to the mix and top off the other ingredients with estimated amounts. The recipe is very forgiving- using more or less cream, butter, or onions won’t make a difference. Mix the potatoes immediately. You should wait until they’re cool enough to handle, but once they are scooped out into a mixing bowl, don’t wait to add the cream, butter, onions, and parsley. Once, I waited for too long, and the texture of the potatoes turned gummy and dense. The hotter the potatoes are when you mix them, the fluffier they will be. Use a wire rack on your baking sheet. It allows air to circulate around the entire potato, ensuring even cooking and crispy skin. Plus, if you put foil down over the baking sheet to catch any crumbs or drips, it makes cleanup a breeze! 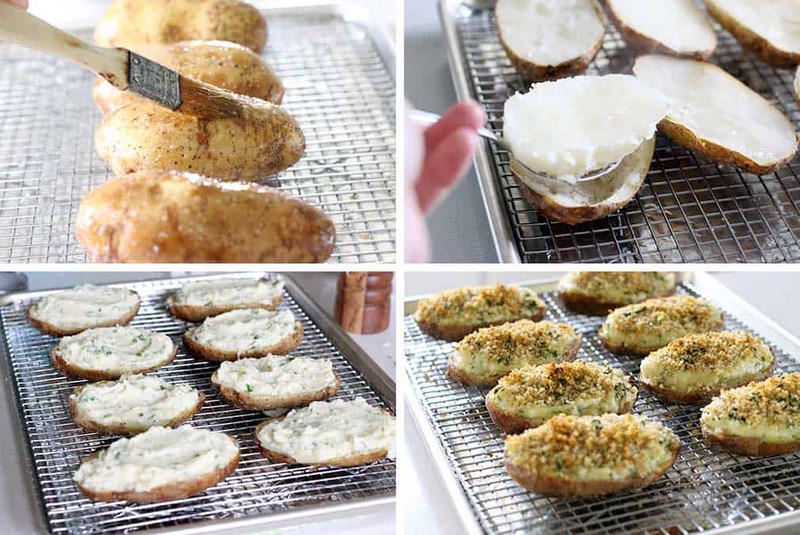 Also, this post on how to make perfect baked potatoes may be helpful for you. Be sure to check out these Baked Potato Chips with Chinese BBQ Mix from Omnivore’s Cookbook (an awesome appetizer or snack to feed your guests), and this Russet and Sweet Potato Tian with Brown Butter and Sage from Panning the Globe (a GORGEOUS main potato dish) for today’s other #PotatoPalooza recipes. 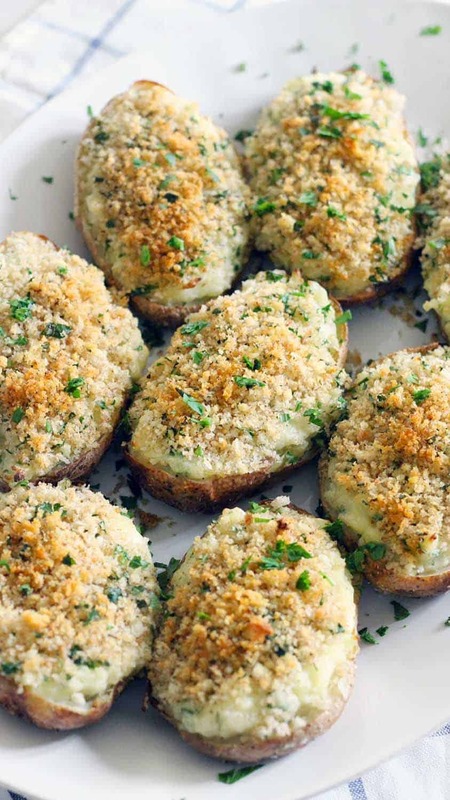 Recipe for Twice Baked Potatoes below- enjoy! 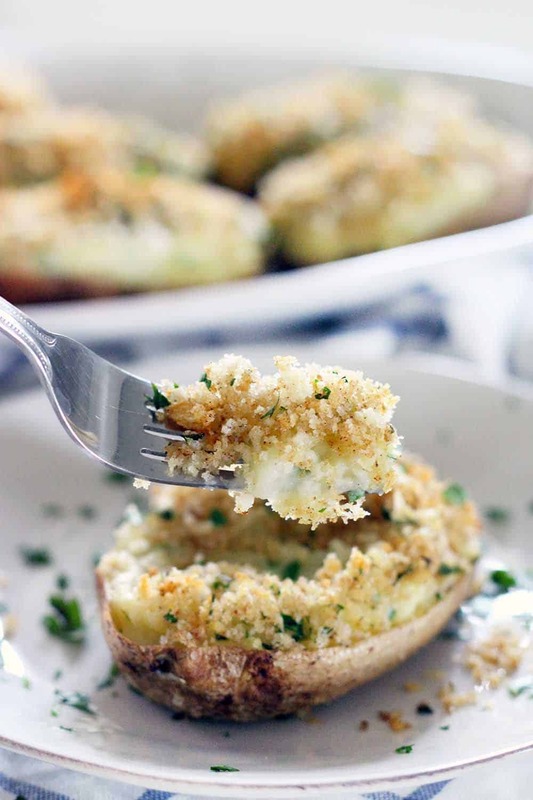 Creamy on the inside, crunchy breadcrumb topping on the outside- these are the BEST twice baked potatoes EVER! Plus, they're freezable if you assemble ahead of time or have leftovers. They're my late grandfather's famous family recipe. Wash, scrub, and dry potatoes very well. Poke a few holes using a fork around all sides of the potatoes. Melt one tablespoon of butter and mix with salt and pepper to taste. Brush potatoes with the mixture and place on a rimmed baking sheet fitted with a wire rack (alternatively, you can place them directly on the top oven rack with a baking sheet on the lower one to catch any drippings). Bake potatoes for 50 minutes in a 425 degree oven, or until soft and cooked (insert a paring knife to check softness). Meanwhile, add grated onion and 4 tablespoons butter to a microwave safe bowl or measuring glass. Microwave for one minute or until butter is melted. In another microwave safe bowl, melt the remaining two tablespoons of butter. Add the breadcrumbs, paprika, 2 tablespoons parsley, and a little bit of salt and pepper. Allow potatoes to cool for 10 minutes. Cut potatoes in half and scoop the insides into a bowl. Don't scoop all the way to the outer peel- leave a little bit of potato for structural stability. Add the melted butter and onion mixture, heavy cream, 1/4 cup chopped parsley, and salt and pepper to the bowl with the potatoes. Mix using an electric mixture until smooth. Add the potato mixture back into the potato skins evenly and smooth the tops. 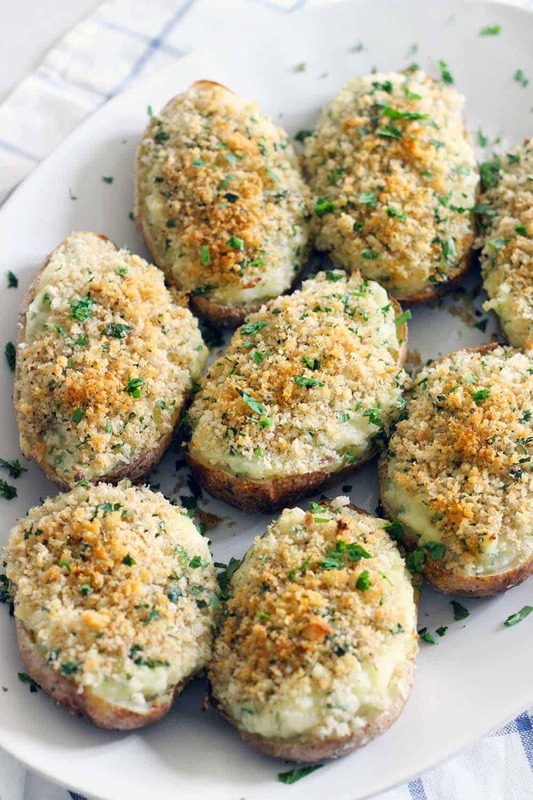 Place the potatoes back into the oven at 425 degrees for 20 minutes, or until breadcrumbs are golden brown. I love that you can make these ahead of time and freeze them. That’s the best when you have lots of family in town! Thanks, Maggie! Lucky for me, I still have two left in my freezer (somehow… don’t know how that’s even possible!). These potatoes look amaaaaazzzzing! Your grandfather was a brilliant chef. I am so excited to make these for my family.